The scene is colourful and chaotic, as hundreds of people flood in for today’s food distribution. Most of them are mothers carrying their babies; some have gotten up early and already walked for several hours, carrying big buckets, jugs of water, and their children. World Vision has been running food distributions here in Northern Bhar-el-Gazal since February, making sure that thousands of people don’t succumb to starvation. 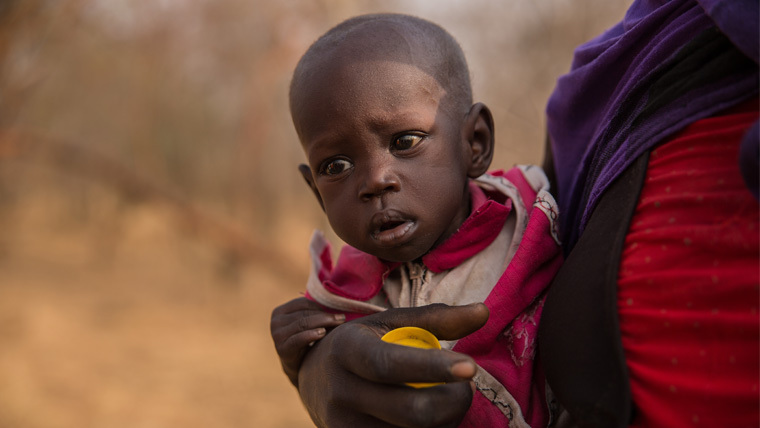 Adele is one of the mothers who receives life-saving aid. Akir, her 10-months-old daughter sits on her lap, her young skin hanging from her frail bones. She’s severely malnourished and while she’s trying to get some milk from her mother, there is none left. Adele has been eating leaves for the past weeks, but in the last four days, she had no food at all. “I heard about the distribution and it was my last hope,” Adele says. She’s sitting in a barren field, trying to calm down Akir, who is crying ceaselessly. 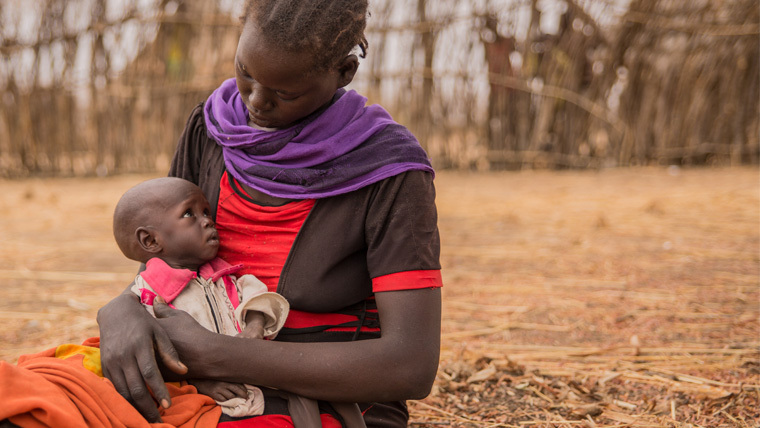 “If I get supplies here today, I will be able to eat and, in return, it means that I can feed my baby too.” Her husband ran away, too overwhelmed with the task of taking care of a family. It’s Adele’s first time at a distribution and she’s quickly learning that the process is well structured. “I learned in the past that I can’t just show up here, but I first have to go through health screening to qualify for the free food,” she explains. 500 families are targeted today, which equals up to 3,500 individuals. Many more have come to register. Kenneth knows how much effort goes into rolling out a distribution. “Most of our food either comes from Uganda or India. If it’s from overseas, it can take up to six months to get here. Whenever we import from Uganda, we have to drive it up here in a convoy, passing through many unsafe regions of the country. There are always security risks,” he adds, standing in front of a pile of bags full of sorghum and beans. Kenneth managed bring some order to the distribution, and families are now lined up neatly. They carry their registration cards and wait patiently for their food. Nobody is in a rush. Many have arranged to sleep nearby the distribution site, as walking home for several hours in the late evening is not wise. Adele is one of the women who is waiting in line. “For the first time, I’m confident that I can manage by myself,” she says. “My husband divorced me, saying he wouldn’t be able to provide for the children and me. He said he couldn’t feed me, and then left. From today on, I will be able to manage myself.” She tightly holds on to her registration card, her face pained, but also determined. “I’m thankful for this distribution. 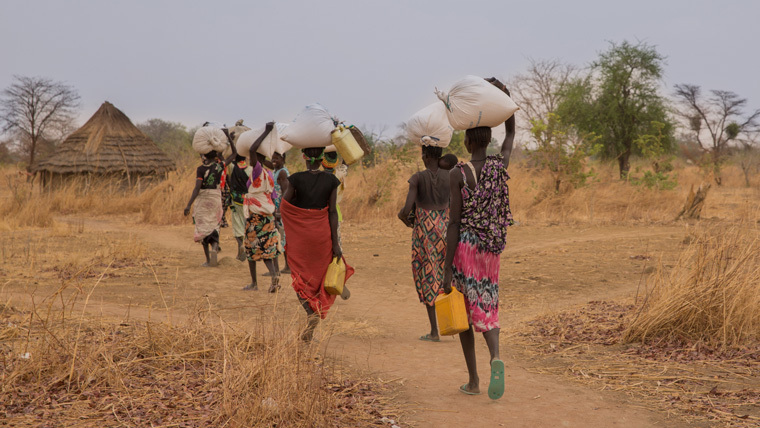 I can manage with World Vision’s help,” she says, dragging away her 25 kg bag of beans.